Frank Arthur Erickson was born on November 6, 1907 in Tillamook, Oregon, but was raised in Portland. He enlisted in the U.S. Navy in 1925 and earned admission to the Naval Academy in 1927, reporting to Annapolis on June 15, 1927. Resigning his appointment in February of 1928, Erickson then enlisted in the U.S. Coast Guard on April 26, 1928, where he also received an academy appointment, this time to the Coast Guard Academy on August 11, 1928. He graduated on May 15, 1931, and earned his commission as an ensign on that same day. 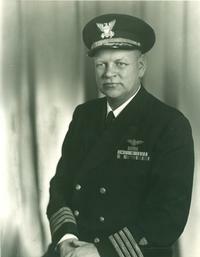 Following his time at the academy, Erickson spent several years at sea duty before graduating from the Navy Flight School in Pensacola, Florida in 1935. Designated as Coast Guard Aviator Number 32, he spent time on both coasts flying seaplanes. Even though assigned to the U.S. Coast Guard Cutter Taney in 1935, his seaplane was based out of Naval Air Station Pearl Harbor. On the morning of December 7, 1941, Frank was working as Air Station Duty Officer in the airfield control tower on Ford’s Island, in full view of the Japanese attack on Pearl Harbor. Erickson spoke frequently of the tragedy and how he could never forget the images of sailors stranded in fiery, oil covered waters desperately trying to get ashore. As a Coast Guard Officer, Lieutenant Erickson was trained to save lives, so he immediately saw the need for a faster, better, and more capable rescue method. Erickson’s vision and determination to make the rescue helicopter a reality was born on that day. Another Coast Guard Aviator, Commander William Kossler, had been one of Erickson’s instructors at the Coast Guard Academy. In 1940, Kossler was assigned as the Aviation Engineering Officer at the Coast Guard Headquarters in Washington, D.C., and soon after acquired the collateral assignment as the Coast Guard’s representative to an Inter-Agency Board, chaired by the Army Air Corps and created to investigate and purchase an experimental helicopter. When, on April 20, 1942 at the Vought-Sikorsky plant, the first official American helicopter demonstration took place, Commander Kossler, as a member of the Inter-Agency Board, witnessed firsthand the flight of the new Sikorsky XR-4, Sikorsky’s first attempt at a production helicopter intended for military use. Kossler was so impressed by this demonstration that he dedicated the rest of his life to executing plans for integrating the helicopter into the Coast Guard organizational structure. But it would take the further perseverance of his friend, Lieutenant Commander Erickson, to make this a reality. Undaunted by this rejection, Kossler arranged for Erickson to visit the Sikorsky plant on June 26th, 1942. Following his inspection of the XR-4 development program, Erickson submitted a report within three days to Naval Headquarters recommending the procurement of helicopters for convoy antisubmarine patrol as well as for search and rescue. Wisely, Erickson had placed emphasis on the antisubmarine role of the helicopter operating from small platforms built onto the decks of cargo ships. In June of 1942 alone, German submarines sank a record 55 U.S. merchant ships for a total loss of 289,790 tons. Then on February 8, 1943, Kossler wrote to the Coast Guard Commandant, Vice-Admiral Russell R. Waesche, arguing that the helicopter might help solve the submarine menace. Waesche then requested to see Sikorsky’s helicopter. Along with Kossler and Erickson, he visited Sikorsky’s Bridgeport plant on February 13, 1943 for a flight demonstration. Upon his return to Washington, Waesche met with Admiral Ernest J. King, Chief of Naval Operations; and on February 15, 1943, King issued a directive ordering a test and evaluation program for helicopters. On February 16, 1943, Vice-Admiral Waesche ordered Commander Kossler to create a training program for pilots and maintenance crews, and to direct the organization of supporting stations. The Navy accepted its first helicopter, a Sikorsky YR-4B, Navy designation XHNS-1, BuNo 46445, at Bridgeport, Connecticut on October 16, 1943, with Erickson conducting the one-hour acceptance flight. On November 19, 1943, the New York (Brooklyn) Coast Guard Air Station earned designation as the first U.S. Naval Helicopter Training Base, with newly-promoted Commander Erickson as its Commanding Officer. Erickson soon began to train Coast Guard, Navy, Army Air Corps, and British helicopter pilots. The Army transferred two additional YR-4Bs to the Navy and in time had transferred a total of 20 YR-4Bs from the Army contract of 100. However, according to its records, between October 1943 and December 1944, the U.S. Navy accepted 68 YR-4Bs (HNS-1s). Erickson and his small group of newly-qualified pilots continued to train additional pilots and most importantly helped to develop helicopter procedures not only for antisubmarine warfare but also for search and rescue. They initiated the development of helicopter flotation systems, instrument flight capabilities, and autopilot systems, as well as rescue hoists and rescue baskets—crucial steps forward for maximizing the unique flight and rescue capabilities of the helicopter…Igor Sikorsky’s paramount reason for perfecting his helicopter as a lifesaving machine. The original hoist was made from junkyard parts; and on August 11, 1944, Commander Erickson began testing a bomb-loading electric hoist installed in an HNS-1. After four days of testing over Jamaica Bay, New York, the feasibility of a rescue hoist was clearly demonstrated, but it was too slow and underpowered. His men switched to a hydraulically powered hoist that could lift 400 pounds at two and a half feet per second. Today, the rescue hoist is standard equipment on all rescue/MEDEVAC helicopters and has saved thousands of lives, especially in 2005 during Hurricane Katrina when helicopters were unable to land anywhere within the city of New Orleans yet managed to save almost 35,000 lives. Even today, the rescue basket is often referred to as the Erickson Basket—an enduring tribute to this man’s legacy. But this all came at a price to Erickson. His unabashed enthusiasm for the helicopter isolated him from both his colleagues and superiors who believed that the proven seaplane was still the means of rescue for the future—not the helicopter—since many believed it unproven and of limited ability. But on January 2, 1944, the first Atlantic convoy that used the new antisubmarine helicopter patrol capability sailed from New York to Liverpool, UK, with three HNS-1 helicopters. With the support of Captain Kossler and Admiral Waesche, Commander Erickson had been able to sell the Navy on the concept of using the helicopter in the convoy antisubmarine patrol role. On January 3, 1944, Commander Erickson performed the first recorded helicopter mission of mercy when he flew an HNS-1 through a winter blizzard of snow, sleet, and 25 knot winds to deliver a cargo of blood plasma from Manhattan Island, New York, to the Hospital at Sandy Hook, New Jersey, to treat over 100 wounded sailors injured in explosions aboard the Navy Destroyer USS Turner which had sunken off the cost near Sandy Hook. This event received significant attention in the media and helped to reverse the perception of helicopters as impractical machines. By the end of 1944, the British moved their helicopter training back to England and the U.S. Navy stopped training helicopter pilots because of the demand for fixed-wing pilots. On February 6, 1945, the sixth and final class graduated and the school was closed. Erickson’s helicopter training school had graduated 97 helicopter pilots, including 71 U.S. Coast Guard, 7 U.S. Navy, 11 British, 4 Army, 2 civilians, and 2 CAA pilots. The school had also trained 255 mechanics. In April of 1945, Erickson’s command of the Navy Helicopter School thus ended, followed by designation as the Chief, Research and Development Office where he could devote himself full-time to the development and testing of helicopters. In June, 1946, he was assigned to Coast Guard Air Station Elizabeth City, North Carolina. The helicopter training and equipment had been moved there because of better flying conditions. Consequently the Rotary Wing Development Project Unit was established there, as well. From April, 1950, to November, 1951, then-Captain Erickson was assigned as the Coast Guard Liaison Officer at the Naval Air Test Center, Patuxent River, Maryland. There he completed and graduated from the Navy Test Pilot School on January 27, 1951. After graduation, he was assigned to Coast Guard Headquarters as the Assistant to the Chief of the Aviation Division until July of 1952, when he then accepted duty with the Civil Aeronautics Administration in Washington, D.C. Originally appointed as a member of the National Advisory Committee for Aeronautics Committee on Helicopters in 1951, he enjoyed reappointments in 1952 and again in 1953. Returning to New York in January of 1953, Erickson served in the Operations Division as the Chief of the Search and Rescue Section at the Third Coast Guard District Office Headquarters until he retired on 1 July 1954. He would then take a position as the Chief Test Pilot of Brantly Helicopter Corporation while continuing to design a helicopter flight-path stabilizer. He assisted NASA's Gemini program in developing a hoist system to lift an astronaut out of the water in emergency situations and consulted with the designers of the Coast Guard's new 210-foot Reliance Class cutters in designing those vessel’s helicopter landing pads. Captain Frank A. Erickson passed away on December 17, 1978. Erickson and Kossler are both stunning pioneers and true architects of Coast Guard rotary-wing aviation and were instrumental in saving thousands through their dedication to perfecting the helicopter as a lifesaving machine—particularly through their ingenious rescue hoists and baskets. Frank Erickson turned a visceral response of horror after witnessing the carnage at Pearl Harbor into a life-long career which would reverse that image for tens of thousands, rescued on land or sea by Coast Guard and all MEDEVAC helicopters. • Erickson Hall, where the Coast Guard’s aircraft flight simulators are located in the Aviation Training Center, Mobile is named in his honor. • Naval Aviation Hall of Honor, National Naval Aviation Museum, 1990. • The Coast Guard Aviation Association sponsors the annual Erickson Award which recognizes rotary wing flight crews who demonstrate exceptional performance while engaged in search and rescue operations. Barrett Thomas Beard, Wonderful Flying Machines: A History of U.S. Coast Guard Helicopters (Annapolis: Naval Institute Press, 1996). Arthur Pearcy, A History of U.S. Coast Guard Aviation (England: Airlife Publishing Ltd., 1989). Paul Fardink, “The Unsung Hero of Hurricane Katrina: The Helicopter,” The American Helicopter Society 72nd Annual Forum, 17–19 May, 2016, West Palm Beach, Florida.